This summer, Blackboard plans to introduce a virtual bookstore accessible directly within the learning management system. The e-commerce system, still under development, will allow students to purchase course materials assigned by the instructor — new, used and rental textbooks, e-textbooks, digital content and more — pre-populated in a personalized shopping cart. Faculty will be able to search the store for instructional content, and assign both commercial and open materials for a particular course. Publisher content from partners such as McGraw-Hill Higher Education, Pearson, Wiley and more. Blackboard will kick off the bookstore initiative with a limited trial at about a dozen higher education institutions this spring, including Central Texas College. "We are excited by the opportunities that will be afforded to our students and faculty through Blackboard's online bookstore," said Thomas Klincar, chancellor at Central Texas College, in a prepared statement. "It promises to further enhance the online learning experience. By bringing a rich complement of learning content and faculty resources into our existing LMS, we will be better able to serve the diverse needs of our students and help them succeed." 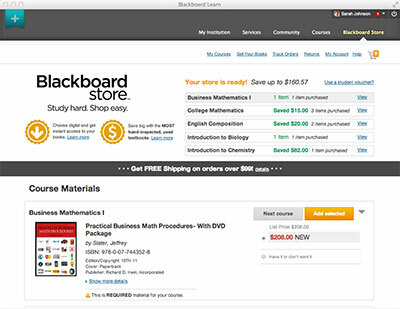 The Blackboard bookstore will be made possible through a strategic partnership with online bookstore provider MBS Direct. For more information, head to the Blackboard site.